This blog is primarily about baseball, but I occasionally will dabble in other sports and issues related to sports. Under the banner at the top of this page, I say, “Mostly baseball. No politics. No religion – unless you count baseball.” I respect the political and religious beliefs of others; however, nothing ruins a good website, social media site, or blog like the introduction of politics and\or religion. Therefore, I choose to steer clear of those subjects, which should go a long way toward ensuring a civil discourse on this site. I appreciate your indulgence and cooperation. I grew up in Cheap Hill, Tennessee and I am a lifelong Atlanta Braves fan. I follow the Tennessee Titans, Nashville Predators, and Vanderbilt Commodores when not following the Braves. I am an avid reader and some of my favorite books are The Great Gatsby by F. Scott Fitzgerald, The Life and Times of the Thunderbolt Kid by Bill Bryson, A Prayer for Owen Meany by John Irving, Big Fish: A Novel of Mythic Proportions by Daniel Wallace, Moonglow by Michael Chabon, and Max Perkins: Editor of Genius by A. Scott Berg. I wrote a weekly column entitled “The Way the Ball Bounces,” mostly about baseball, for the I-24 Exchange newspaper in Pleasant View, Tennessee for eleven and a half years. I am collecting rejection slips on a novel entitled Ghost Man On Second. I graduated from Cheatham County Central High School in Ashland City, Tennessee and from Austin Peay State University in Clarksville, Tennessee. My wife and I reside in Pleasant View; we have a son, Sean, who lives in Nashville. 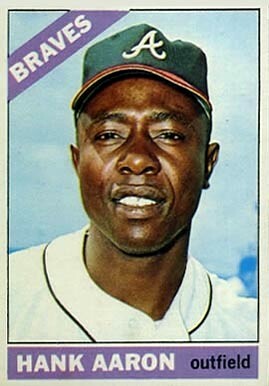 And by the way, when some player comes along and hits his 756th home run, and all of them were hit without the aid of performance-enhancing drugs, a corked bat, or an Underdog super energy pill, I will take down the fabulous 1966 Topps Hank Aaron baseball card and replace it with the Topps card of the new legitimate home run king; Barry Bonds and Alex Rodriguez need not apply. Until such time, Henry Aaron rules. I appreciate those of you who visit my blog and read my posts. I look forward to your comments and feedback.